Providing you the best range of magicblox (aerated autoclaved concrete block), magicblox (autoclave aerated concrete wall block) and magicblox (aac building blocks) with effective & timely delivery. Size (Inches) 9 In. X 4 In. X 3 In., 9 In. X 3 In. X 2 In., 12 In. X 4 In. X 2 In. Aerated Autoclave Concrete Blocks contain 80% air and therefore weigh only 1/3rd of a Clay Brick. It is formed as a reaction of aluminium metal with a blending proportion of lime, cement, gypsum & Fly Ash. The hydrogen gas escapes from the reaction giving AAC bricks a strong honey-comb structure. Also termed fly ash blocks these are further cured in an autoclave under high-pressure steam to give it desired strength. The production process of AAC blocks has to be very carefully monitored to insure a controlled consistency in the proportions and timing of all ingredients that are used in each batch so that the output is consistent. Block weight is significantly lower than clay bricks of equivalent volume.This leads lower dead weight of the structure and a hence lower requirement for steel and cement in building the structure. Since Magicrete AAC blocks weigh almost 80% less than clay bricks, they significantly reduce the dead weight of the structure which can result in huge costs savings attributed to a reduction of steel and cement use. Magicrete AAC blocks have a very high compressive strength and hence they are suitable for varied kind of structures including high-rise, hospitals, schools, independent homes, office buildings, manufacturing units etc. The AAC blocks’ compressive strength is in the range of 3.5-4N/m2 while that of clay bricks is around 2.5-3N/m2. To cover North India we have our another plant in Jhajjar (Haryana). We serve in Delhi, Ambala, Bhiwani, Faridabad, Gurgaon, Hisar, Kaitha, Karnal, Kurukshetra, Panchkula, Panipat, Rewari, Rohtak, Sirsa, Sonipat, Yamunanagar, Himachal Pradesh, Mandi, Jammu & Kashmir, Punjab, Amritsar, Rajasthan, Jaipur, Ajmer, Alwar, Kota, Sikar, Udaipur, Uttar Pradesh, Agra, Ghaziabad, Lucknow, Uttarakhand, Haldwani. Magicrete Building Solutions is engaged in the business of innovative building materials and prefabricated construction technologies and is one of the largest manufacturers of Autoclaved Aerated Concrete Wall Blocks. 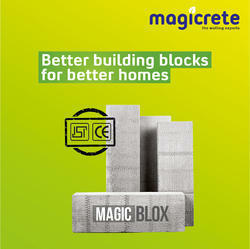 The core product of Magicrete is AAC (Autoclaved Aerated Concrete) Blocks. AAC Block is a replacement of traditional red clay brick. AAC Block weight only a third of the clay brick that substantially boosts labor efficiency while saving structural steel consumption and operational costs. It may increase the carpet area as well by 3% to 5% depending on the design. Moreover, AAC blocks are several times larger than traditional bricks, culminating in lesser mortar usage. AS the blocks are factory finished with precise edges and shapes, they require substantially less plaster, POP, or putty finish. To furnish the diverse requirements of our clients in the best possible manner we are involved in offering an extensive range of AAC Building Blocks. These are available in different sizes and thicknesses according to the needs of our valued patrons. These manufactured using best quality material which we procured from the leading vendors of the market. We also assure safe and timely delivery of our products.